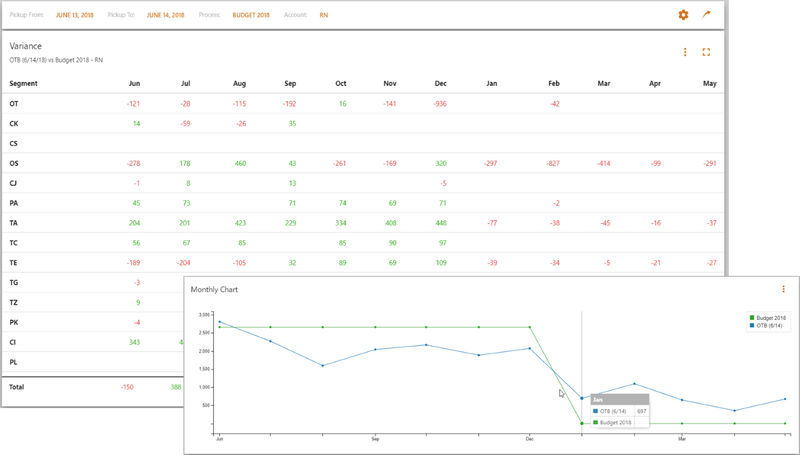 PickupTracking is a cost-effective alternative to elaborate Excel solutions that greatly require constant manual effort and are highly prone to errors. Save your valuable time to input and maintain Excel lists, and use the time gained for more important tasks. 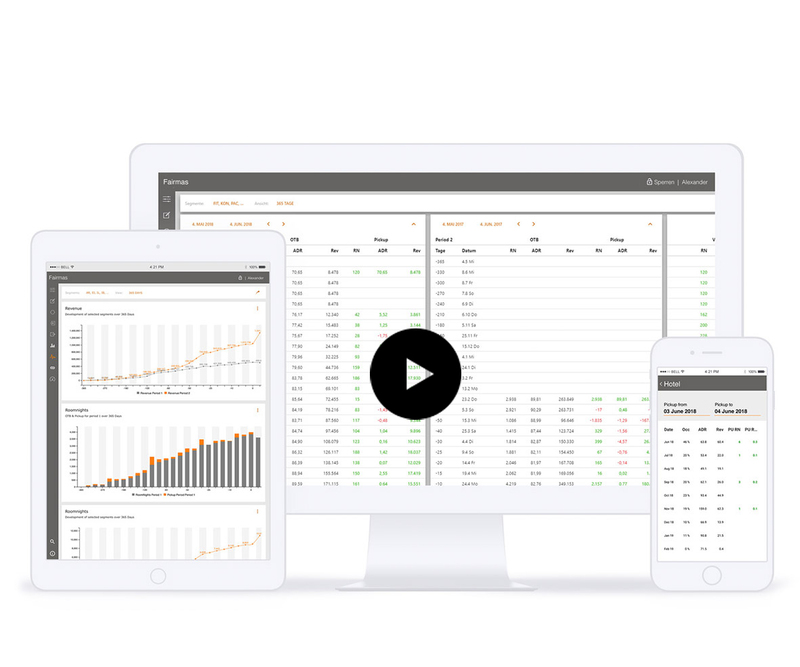 PickupTracking shows your occupancy, average rate and revenue, as well as changes of today and rolling for the next 365 days into the future. In case of deviations, you gain the needed time to act proactively in order to achieve your targets. With PickupTracking, get all the relevant hotel key figures of your booking situation and changes, all with just one click. Easily access all decision-relevant information – within variable periods and with flexibility in the depth of information. PickupTracking is specifically designed for revenue managers, reservations managers, reception managers and hotel directors. 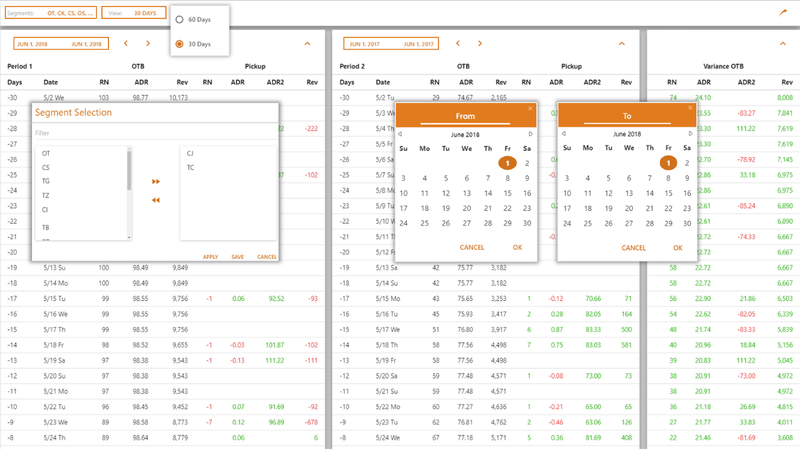 Get a quick and uncomplicated overview of your current booking situation and all changes (“pickup”) on a day-to-day basis. PickupTracking breaks down barriers between different systems and imports data via interfaces automatically. With the automated data exchange, PickupTracking improves synchronous data processing and reduces possible sources of errors. A variety of available standard interfaces ensures the fast and complete integration of PickupTracking into existing IT systems. If you are using a Property Management System for which an interface is not yet available, we are happy to extend our services. 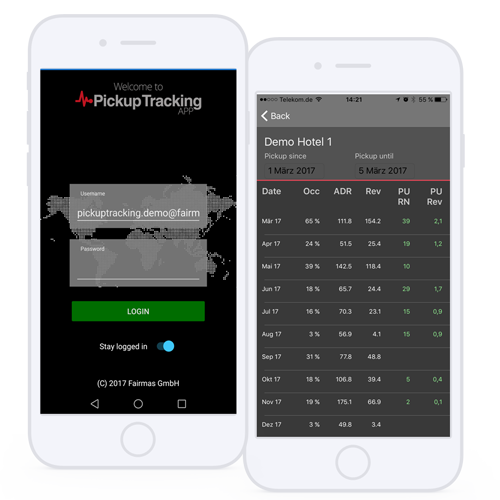 The PickupTracking APP is the mobile variation of the software allowing you access to all relevant data such as ADR, Revenue and RevPar – no matter where you are and what time it is. It is an additional information tool for all revenue managers, reservation managers, reception managers and hotel directors. With the PickupTracking APP, your management has the freedom to access relevant hotel figures ad hoc, whenever information is needed. It also increases transparency for all decision-makers and reduces the risk of misjudgment. The PickupTracking APP is available for both iOS and Android operating systems. 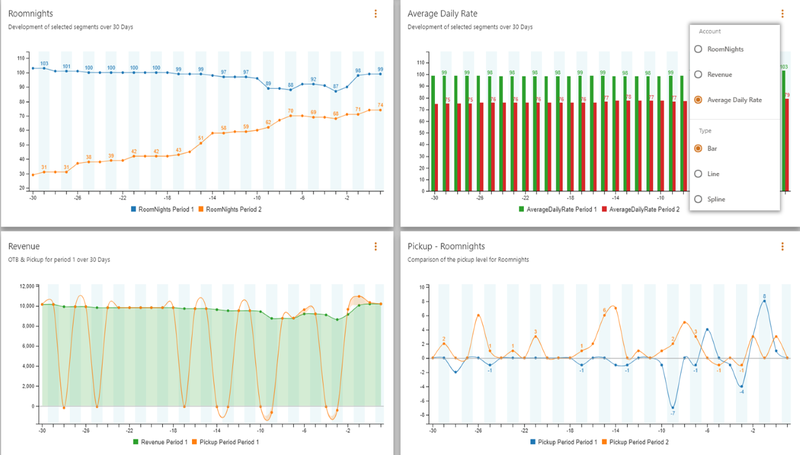 With PickupTracking, you get detailed key figures per day and market segment for room nights, average rate and revenue. In addition, “Out-of-Order” rooms and the overbooking status are displayed. 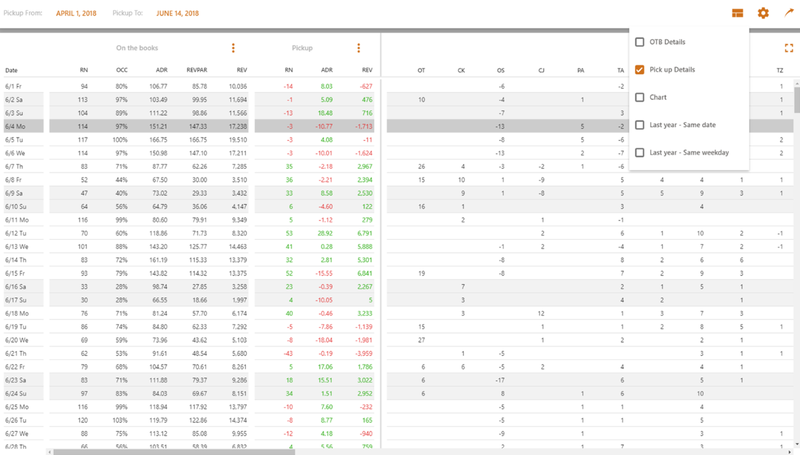 Compare current and historical pre-booking conditions as PickupTracking automatically calculates the changes (“pickup”). All booking conditions and the development of the pickup can be directly compared to previous year’s figures, budget or forecast at any period you want (day, month, year). PickupTracking is easy to integrate into your existing structure and can be used as a multi-property version for several hotels. With one click, you can send all reports by e-mail. 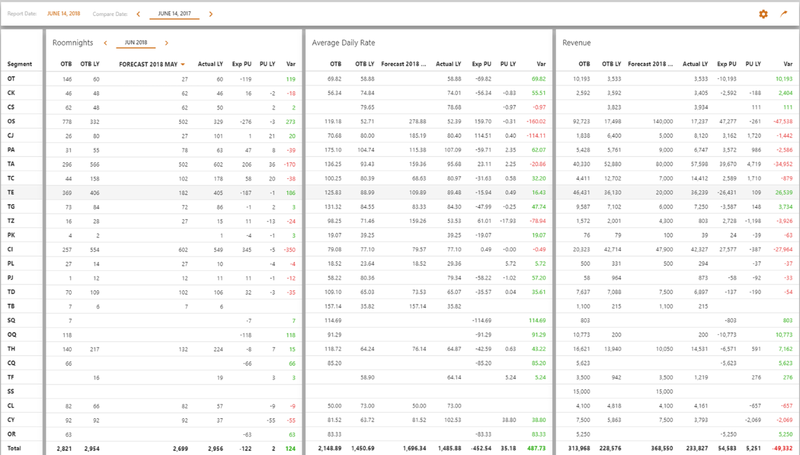 Find out with little effort how occupancy, room rate, revenue and RevPar pickup in comparison to the previous year, and whether the figures correspond to your forecast and budget. See clear tables – how many reservations and bookings have been made, how much revenue and RevPar have been achieved. Determine the depth of detail yourself, and analyze your data either by segment or as divided in definitive (deducted) and tentative (non-deducted) bookings. 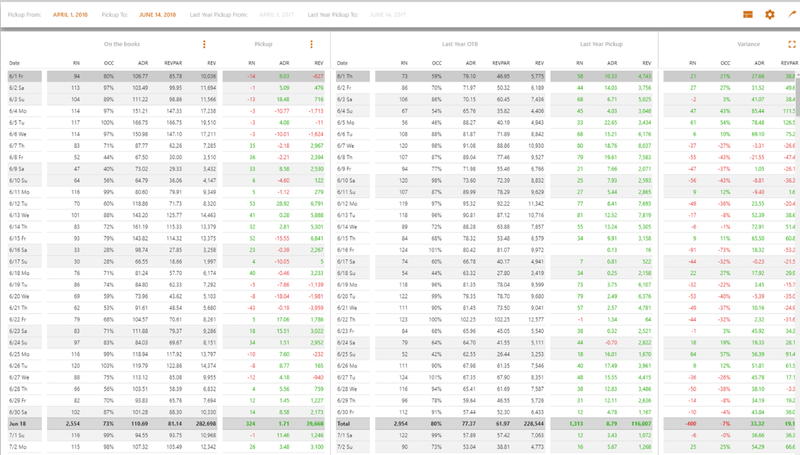 Go into the ”Detail View” of PickupTracking to find out how special sales measures succeed. All booking conditions and development of the pickup can be directly compared to the previous year’s figures, your budget or your forecast for different periods (day, month, year). 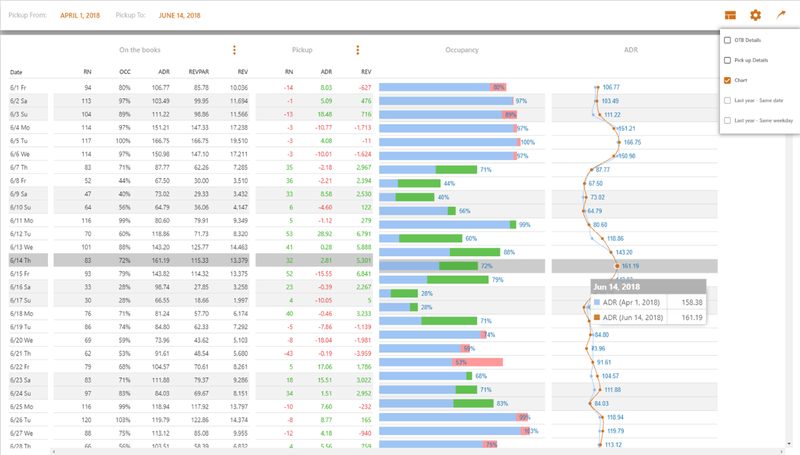 The direct comparison of your “On-the-Books” data, separated by segments combined with the actual bookings, as well as cancellations by room night, shows trends and developments and helps you determine the causes of plan deviations. The daily pickup for each market segment and 365 days in advance provides you with the necessary information to be able to intervene at an early stage. a free 30-minute online presentation.